Come out to Washington Avenue for a car-free stroll, skate or bike ride on the open street! "We're ending the month with our fifth #MBCiclovía on Sunday, April 30 by transforming Washington Avenue from 5 to 16 streets into a paved park for people of all ages to stroll, cycle, skateboard, rollerblade and enjoy a new experience and the businesses along Washington Avenue." DJs & live Music from Y100 Miami and more! Washington Avenue from 5 to 16 Streets will be closed to vehicular traffic during this event. For attendees traveling to the event by motor vehicle, you are encouraged to park at the garages on Collins Avenue at 7, 13 and 16 streets. Don't forget your bikes, skates and skateboards! Try using our Miami Beach Trolley or take a ride in our green bike lanes. When your at the event there will be no motorized vehicles allowed on Washington Avenue. What can I use in the event? Everything that doesnt have a motor! 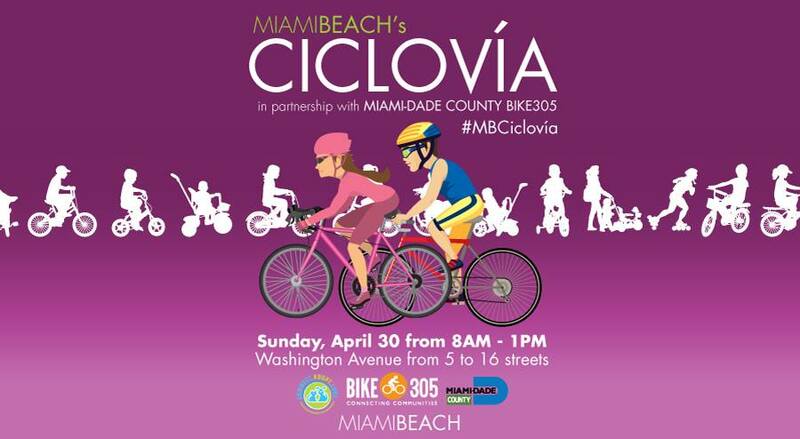 Ciclovía is about exploring alternate modes of transportation while being mindful of your community and wellness. Definitely, CitiBike is available all through out our city. Use the promo code 95927. Can I bring lawn chairs and just hang out? Can I bring my motorbike or hoverboard? No. The streets are open to non-motorized or emergency vehicles only. Hoverboards are not allowed. Ciclovía has no official start or end point. Come as you are to any point along Washington Avenue from 5 to 16 streets to enjoy the day. We hope you will come by foot, bicycle or public transportation. If you would like to drive, we encourage you to park at any of the City of Miami Beach Parking Garages indicated here. You can use any one of the public bicycle racks along the route or you may choose to valet your bike in front of the Police Station from 8:00 a.m. to 1:00 p.m.
What happens at 1:00 pm? At 1:00 pm, Washington Avenue will reopen to regular vehicular traffic. We encourage you to stick around and enjoy everything the neighborhood has to offer.